You'll love this recipe: With just five ingredients and 25 minutes, dinner is on the table. Broccoli rabe, often used in Italian dishes, is an excellent source of vitamins A, C, and K.
You'll love this recipe: With just five ingredients and 25 minutes, dinner is on the table. 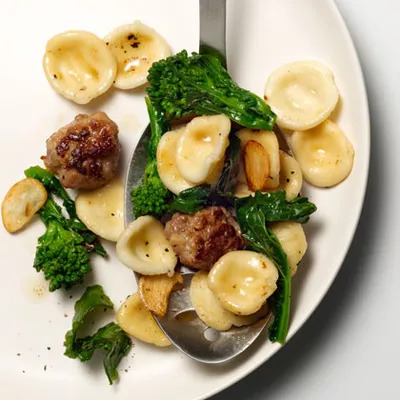 Broccoli rabe, often used in Italian dishes, is an excellent source of vitamins A, C, and K.
We used orecchiette, but you can use any pasta in this recipe. We recommend picking a whole wheat, or whole grain option, which will supply an extra boost of fiber in this already healthy dish. Ingredients: orecchiette, broccoli rabe, olive oil, Italian sausage, garlic cloves.